Zoe can’t remember the details of the terrible mustering accident that put her in hospital. She hates the hospital, but when she returns home everything seems to be different and she’s not sure that she likes that any better. Her best friend and boyfriend are acting weird and don’t return her calls and her father is frustrated that Zoe’s accident and stolen cattle have added to the stress of trying to keep their family farm going. Will the mysterious Josh be able to help her work out what is going on so that her life can return to normal? A few months ago I was trying to find some books for my niece, who is in her mid-teens and is a country girl at heart. I was searching for the teen equivalent of the rural romance/women’s fiction that is so popular at the moment, even going so far as to ask authors Fleur McDonald and Cathryn Hein on Twitter if they could recommend anything that might appeal to my farm-life loving niece. The day after my tweets for assistance, I coincidentally received a review copy of Jumping Fences in the mail from Allen & Unwin. It was exactly the kind of novel that I was looking for – the farming equivalent of a beach read; something light and enjoyable with a little bit of drama and a little bit of romance set in a rural community. Younger teen readers will identify with Zoe as she has to make choices about family and friendships. While the story begins slowly as it sets the scene for Zoe's family situation, the mystery of the missing cattle and developing romance will keep readers turning pages, as will a few unexpected twists that add to the suspense of the story. Jumping Fences is an engaging teen novel that will particularly appeal to girls in their early to mid teens who want to read stories with a rural rather than big city or coastal setting. 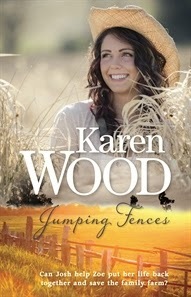 Author Karen Wood has previously written five books in the Diamond Spirit series featuring horse-loving central characters, however I hope that she has further books in the style of Jumping Fences underway for those girls whose interest in country life extends beyond the stables to other aspects of farming life.